Blue Cross Blue Shield of Arizona is looking for the next great kid chef to create a delicious and healthy side dish recipe. Finalists will sample their culinary creations at a Phoenix Suns home game and win great prizes. For the seventh consecutive year, the company is on the hunt for original, great-tasting and kid-inspired side dish recipes for the Walk On! Kids Cooking Challenge. The program’s goal is to motivate Arizona’s youngest culinary masterminds to incorporate healthy options into their daily food choices. Children ages 9–12, living anywhere in the state of Arizona, are encouraged to submit their healthy and tasty side dish creations for a chance to win a new bike. 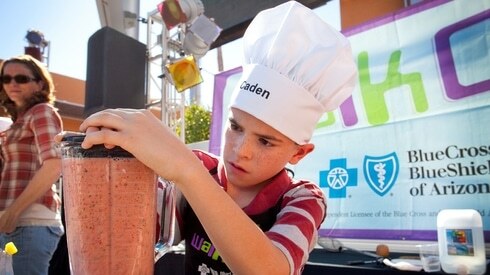 Finalists will also have an opportunity to prepare and share their masterpiece at a Phoenix Suns home game. The top five recipes will be selected based on nutritional value, taste and originality. Finalists will be invited to present their creations at a Phoenix Suns home game Feb. 10 at the Talking Stick Resort Arena. After the cooking demonstrations, recipes will be posted online at www.walkonaz.com for a public vote. Voting will be open from Feb. 10-22. Last year’s contest winner was Briony Campisi, an 11-year-old from Phoenix. Her winning dish was the unique and colorful Rainbow Mango Strawberry Salad Taco. Visit www.walkonaz.com for complete contest details and to submit a recipe. All entries must be submitted no later than Wednesday, January 25, 2017. This entry was posted in Mind, Raising Tweens and tagged cooking with kids, kids cooking, tweens contest. Bookmark the permalink.